Born and raised in Rumford, Rhode Island, just a 30 minute drive from Numark's headquarters, Cory Almeida has climbed the ranks of the DJ and Entertainment industries to become a part of the most successful shows on TV today. If you have had the elite pleasure of attending an audition, performance or taping of American Idol, Dancing With the Stars, America’s Got Talent or So You Think You Can Dance, you have likely met Cory. His success, however, didn’t happen over night. It was during his time at Emerson College in Boston that Cory got his first taste of the professional music world when he landed a gig as an on-air DJ for WERS 88.9FM. After graduating, he moved to LA and got booked as a dancer for Nickelodeon. 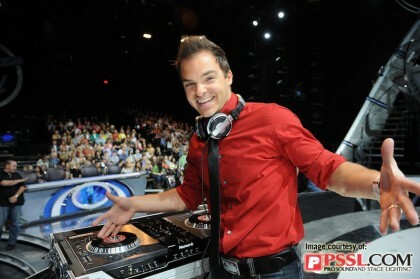 It wasn’t long before producers for the show saw Cory’s energetic personality and hired him on as the host for Totally Nickelodeon, an interactive live show at Universal Studios. 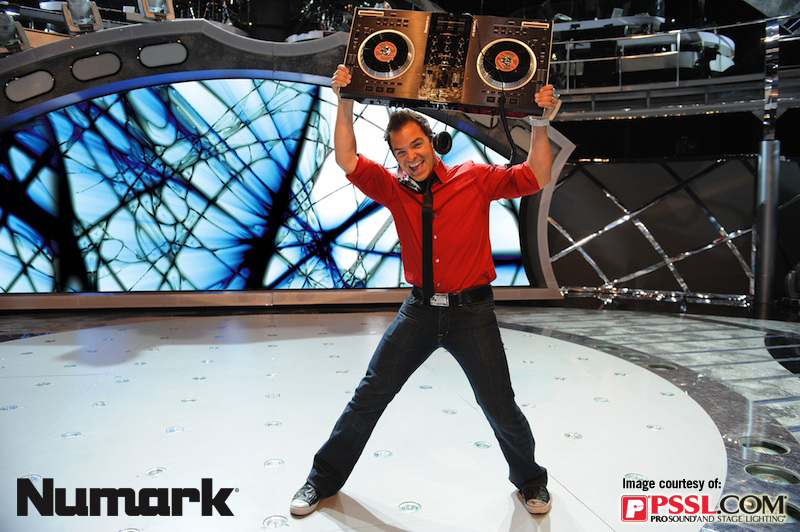 Cory Almeida revs up American Idol with his Numark NS7.From there, Cory started hosting small parties, bar mitzvahs, weddings, sweet sixteens, and even the occasional school dance. No job was too small, and Cory used these events as a way to build up his technical repertoire, until he decided to break out and do something on his own. Five years ago Cory created his own company, ETC Productions, Inc. He put together a full service entertainment company that included DJs, MCs, dancers, and even lighting production. With his newly assembled resources, Cory began focusing on larger corporate events, including everything from lavish New Year’s Eve parties at the Bellagio in Las Vegas, the Queen Mary in Long Beach, and numerous events for major corporations such as AT&T, DirecTV and Disney. Now, Cory is responsible for keeping thousands of people entertained before and during the productions of the biggest TV shows in the country including American Idol, Dancing With the Stars, America’s Got Talent and So You Think You Can Dance. Cory will also be hosting his own show called Pictureka! on The Hub network. What do you do on the shows? CA: It’s my job to make sure that when we go to the air, the studio audience is amped and that energy is visible to the TV viewers at home. I am basically the show’s hype guy. About 20 minutes before the show, I go out and get everyone juiced and fired up with music, dancing, and jokes. I break down what the audience can expect to see on the show that evening, what the director expects from them, what can help the performers and where appropriate applause and booing is needed because we always want to make sure there’s some conflict in there. The judges and producers love that and it’s always great when the audience is at odds with the judges. "I'm basically the show's hype guy. About 20 minutes before the show, I go out and get everyone juiced and fired up with music, dancing, and jokes." CA: That’s kind of it in a nutshell, I’m just a crazy hype man! It was also a great experience doing the American Idol tour and being out in front of 20,000 people.I let the audience know if there are any special cues that might involve them. For example, on Dancing With the Stars, some of the dancers will start their routine from the house. Generally, I’m the link between the show’s producers/directors and the audience. I also get to practice my craft as I stand-in for Ryan Seacrest on Idol. I arrive in the morning and run through the whole rehearsal and block it from beginning to end, teleprompter, cameras, the whole nine. So I actually run through the entire show just like he does later in the evening in the live performance. This gives me an opportunity to work with the show’s director and producers to set up the plan for the audience. It’s great practice for my own upcoming show and the experience of working with real cameras, prompters, etc. is invaluable! Music affects everyone. Before I’m on stage, which is 20 minutes before the show, I start DJing when the doors open. I’m actually playing the music that people are walking into, so I help to create that mood. I’m mixing and watching how the audience is reacting to what I’m playing. The shows have different demographics so what works on Idol doesn’t always translate to what works on Dancing With the Stars. For example, the Jay-Z’s, Black Eyed Peas and Lady Gaga’s are great at Idol and then I jump in to Earth Wind and Fire, disco funk and 80’s at Dancing With the Stars. I always want to continue to build their energy as they’re waiting for the show. Music is carried over and it’s a huge part of my routine. I’m always setting up playlists and trying new things, setting up new angles, but it’s always with music as a backdrop. What differentiates you from other DJs? CA: Many DJs have a real talent and can create ridiculous mixes. Most DJs I know became DJs because they love music. But most DJs bury themselves behind their setup. I started off as a live entertainer and have backed into the music part. I translate that to coming out from behind the gear and getting in the audience’s face and pulling people out to the dance floor. I like to lead dances. I like to get physically interactive with the crowd. At Dancing With The Stars, I sometimes have an hour and half with the audience between pre-taping portions of the show and the live performance. Basically I need to keep the audience engaged and pumped for quite a while and it becomes the “Cory Show.” I put mixes on and bring about 300 to 400 people out to the main stage dance floor and lead them in the Cha Cha Slide, the Hustle, Footloose and I even make up crazy dances. Sometimes the stars and pro dancers will come out and join me as I’m leading these dances. CA: I started with CD’s using a Numark CDN-90 dual CD player with mixer. Later, I moved to the Pioneer offering and picked up the CMX-3000 dual CD player. As I got more and more serious, it was apparent the 1200’s were the choice of pro’s and as Serato Scratch-Live became available, it opened up the doors for me to build my music library without filling up the garage with records. So the logical step was to move to 1200’s, Scratch Live and a Rane Empath three-channel mixer. A large part of the gigs I do require me to be on the road. However, all DJ’s who travel with their gear know that airport security and baggage handlers don’t treat our equipment very nicely. TSA opens everything and they don’t always put things back together the way they should and turntables are very sensitive. I’ve had my turntables totally mangled. I’ve shown up to gig with a tone-arm totally shot and have had to spend a lot of money keeping them up. So I had been looking for something that travels well, but still gives me the turntable feel – so I went to the Numark NS7 because it has a great feel to it. The 45’s are just right, it’s not too tiny as many other controllers are. The platters spin so I’m able to do all the same tricks I would with a 1200 and to top it off – it uses Serato Itch software so I’m used to the feel and music management. I’ve been using the NS7 for the past couple of months and love, love, LOVE it. It looks sharp and feels amazing. I also throw in Ableton Live to add samples, loops and extra beats. Set up time is super fast. I’m in and up in less than 5 minutes which is a lot faster than I was with my turntables. I also use a 15-inch MacBook Pro that I run Serato Itch on. I don’t use anything but Apple products, because I love Apple." CA: I buy all of my gear from PSSL. As a professional being around millions of dollars of production equipment on these shows, I have a great appreciation for the complexities of technical equipment. As far as people who know their stuff and can recommend the gear you need, PSSL’s list of recommendations never end. They are so well schooled in the knowledge base of pro gear. It’s never “Man, I don’t know.” Whenever I have a big purchase, need some heavy duty gear, or just need some questions answered, PSSL is the first place I call. They’ve just got it all! Plus they do what they say and their delivery is ultra fast. All of the people I know in the business make PSSL their first and only call. CA: It’s definitely a personality thing. Some people enjoy just sitting back and doing their thing. You gotta step out and take risks with that stuff, add a different element to what you do as a DJ. Getting out there and getting involved is a huge part of adding a new level, a new element to what you do and who you are. "Getting out there and getting involved is a huge part of adding a new level, a new element to what you do and who you are. "My advice for DJs who want to up their game is to get out and interact with your crowd and find out where they’re at. You can only see so much with your head in your laptop." I’ve definitely had my share of failures. I’ve missed the shot more then I’ve made it, but when I make it, it makes up for all the times I missed. For someone who’s looking to do this kind of stuff, you’re not going to go to a major gig with 5,000 people and knock it out of the park on your first chance. The time to feel your way through is in the smaller events. I got confidence by starting with school dances and weddings where there isn’t as much pressure but you get a chance to get out and interact, and start refining and tooling your craft. But it does take a certain amount of courage to step out there and say you’re GONNA do it. Start small but dream big, and eventually you’ll get to that point when you can get up in front of tens of thousands of people and not even bat an eyelash. "I'm able to do all the same tricks I would with a 1200 and to top it off — it uses Serato Itch software. I've been using the NS7 for the past couple of months and love, love, LOVE it."